Gypsy Scholar: Faustino 1 for a friend . 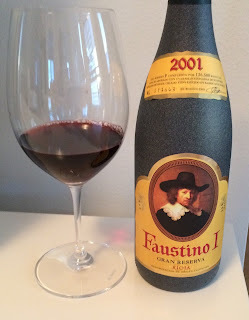 . .
Faustino I Gran Reserva, 2001 has been chosen as Decanter's Number One Wine of the Year. From more than 3,200 wines recommended in Decanter over the past year, their tastings team has picked out not only the highest-scoring but also the best-value wines. With 19.25 / 20 points, Faustino I Gran Reserva 2001 has been positioned as Number 1 out of 50 wines featured. Described [by Decanter] as "Restrained, mineral style with elegant tannins, youthful and fresh, feminine and complex. Deliciously decadent with extraordinary vitality in the palate and a long unique finish. A jewel at this price point!" With ageing potential of another decade, Faustino I makes a great Christmas investment gift - or just open it this Christmas and enjoy its complexity of flavours with your turkey! That all sounds pretty good. I hope it's also accurate - it seems to be. I've read that the Faustino 1 is a dry wine - as I expected - and that the Rioja region is one of Spain's oldest and finest for wine-making (which I didn't know). I should have bought two bottles, one to test and the other to give. Perhaps I will. Meantime, any readers out there who know this wine? Interesting. I've never known a Spanish wine to get that kind of love from "serious" wine drinkers. While Rioja is the most famous region in Spain for fancy wines, my favorite is Rueda, to the west of Rioja. Rueda is famous for its white wines, that are dry but very satisfying, and inexpensive -- just about perfect for summer, imho. Anyhow, I'm supposed to hit Costco this week, so I'll see if I can find some Faustino. Perhaps a bottomless bottle? A bottomless bottle? The name "Faustino" leads one to wonder, given the Auerbachs Keller scene in Goethe's Faust where Mephistopheles magically produces "an endless supply of wine" - if I might borrow an expression by Ilana Walder-Biesanz. Haven;t has that particular brand, but you can't go wrong with a good Rioja (red) or Rueda (white). So sad -- the Costco I went to did not have the Faustino. There is no god. Or your god is not the god of small things . . .